Why does the tinkling of a jingle bell collar incite a nervous clench in your stomach? When a tail lashes suspiciously close to your feet, why cringe and pull them into your chair? For all the fear a stalking, unseen kitty might inspire in you, many people—cat owners especially—find their high jinks amusing, even adorable. Cat home accents enkindle that same playfulness in the home—often with more toes left intact. At first blush, the Sidekick Cat Wall Hook might seem like just another wall accessory to quietly dangle keys or jewelry on your wall. But a sort of camaraderie exists between these two cats—the smallest leaning conspiratorially into his brother as they peer with keen interest over their shoulders. The keys gleaming on their tails are welcome playthings. A playful drama unfolds with this adorable wall hook finished in bronze. The Kitten Trio Table Vase proudly displays your flower arrangements or other accents; what lends it its impish appeal are the three kittens surrounding it. Their fascinated eyes are trained upon the greenery swooping over their upturned heads—you half expect them to sit upright and nibble your flowers! For an alternative to decorative greenery, consider adding your planter of catnip or cat grass to the basket to really tempt these little kittens. A whitewash finish gives the trio an angelic appearance. The kitchen is often a place of wonderment for cats, so it is only fitting to include the Cat and Bird Paper Towel Holder. A cat and bird, both finished in aged patina, are embroiled in a face-off as old as time. The cat, too filled with sun and kibble to pounce, watches lazily from an antique-gold base. The bird peers back from above, unwilling to let his guard down. Cats can bring charm even to paper towel holders! The Kittens Water Fountain, indoors or out, is a cute scene pulled from the backyard. A litter of kittens surrounds this fountain, the boldest kitty crouching close to the accursed water, while the meek hang back and peer apprehensively at their siblings. This resin cat sculpture exhibits realistic stripes and markings, looking more like a snapshot than a table fountain. Finally, the Natural Curiosity Bird Feeder is another item perfect for the outdoors. A golden tabby cat pores over a hollow stump filled with your bird food. After all, where there are seeds, there are birds! A passing snail distracts the mighty hunter as it creeps near his paw. This resin bird feeder displays great detail, right down to the tendrils of fur sprouting inside the kitten’s ears. Whether your own cat power-naps too frequently to invoke a playful air or whether you simply don’t own a cat, these home accents should do the trick for any cat lover! “Polly want a cracker?” Your mind probably registered this phrase in a very particular voice: warbling and prefaced by a squawk. You may have pictured a large, scarlet bird roosting on a shoulder, preening his jeweled plumage of yellows, greens, and blues. 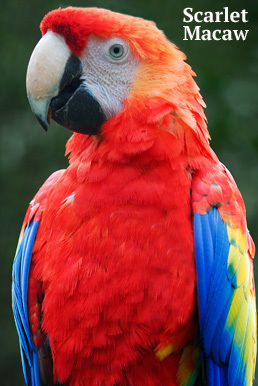 This is the Scarlet Macaw, one of the most popular representations of the parrot—but certainly not the only! Parrots are a motley crew: pet-parrots.com says some are nearly three feet, while others are a mere seven inches. Their range of personalities is even greater! In the animal kingdom, parrots are the life of the party. If removed for too long from the spotlight, they will let you know—sometimes verbally. Most parrots can mimic human speech. With thorough training, these pets can become a welcome addition to your own flock. Which would you choose? Parakeets, Budgies, and Cockatiels are all popular household birds due to their small statures and placid dispositions. Cockatiels and Parakeets can whistle songs and, according to pet-parrots.com, Budgies have the potential to learn up to three hundred words! More mainstream parrot picks are the Lovebirds and Conures. Cultivate that mischievous nature all parrots own by teaching the Blue Crown Conure to stick out his tongue! African Greys, Macaws, and Cockatoos are birds with attitudes proportional to their size. African Greys are fiercely loyal to a chosen family member, and Cockatoos are adept at learning tricks. Macaws are the parrot poster children and have lifespans that extend past even those of a cat or dog. With such a colorful assortment of avian attributes, it can be difficult to choose which parrot is best for you and your family. Things to keep in mind are that all parrots share a drive for mental stimulation—give them challenging toys! Cages must be spacious; if they are not, your feathered friend might have a few choice words for unsuspecting visitors! Parrots require constant handling and attention, but these small investments make for a truly amusing and loving animal companion.